William Ghaits and Margaret Jane Hutton Family. Back Row, Left to Right: William, Melville, Richard, Wilbert. Second Row: Elsie, Maud, Mary, Margaret. Third Row: Isabella, William Ghaits, Samuel, Margaret, Burnette. Bottom: Adaline, Albert, Mabel. Missing: Porter. William Ghaits, son of William and Margaret Hutton nee Ghaits was born in 1864 at Spencerville, Ontario. William G. married Margaret Jane Porter at Oxford Mills, Ontario. Margaret was born in 1866, at Oxford County, Ontario, daughter of Andrew and Isabella Adeline Porter, nee Boyd. They remained in Ontario where William worked for farmers, but decided to venture west. 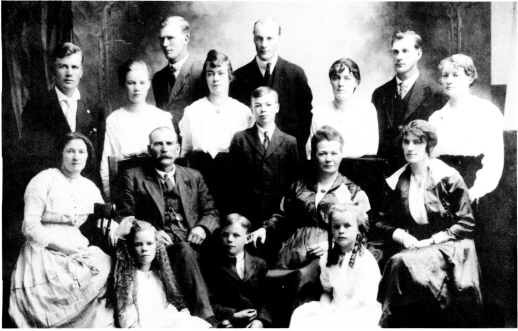 In March 1891, they arrived in Minnedosa and were met by Robert C. Boyd. On arrival in Minnedosa, William with only $37 went to work for Mr. Roche, for the summer. Margaret kept house for Mr. Roche. In the fall they moved to Andrew Boyd's and helped with the fall work. A Mr. Porter, no relation, came to sell them the farm Joseph Burton was living on, the S.W. 12-16-17W. The down-payment was $200 which was a lot of money at that time. However, the deal was closed and the Hutton and Burton families lived in the same house till Burton's moved to Franklin in the spring. William was handy with an axe so he began clearing land for crops. The wood was cut into cord wood and sold in Minnedosa for $1.75 a cord. In later years he drew wood from Bald Hill in the Riding Mountain National Park. He purchased a horse-powered sawing machine and went from farm to farm sawing wood. An average day's sawing was about 20 loads of wood. Six to eight men carried up the poles and there was the sawyer and block thrower. William purchased more land. He bought a steam engine and separator. He and his son, Wilbert, who ran this threshing outfit did custom threshing for their neighbors. Margaret was kept busy knitting, sewing, preparing food for meals and helping with outside chores. She washed and baked for several bachelors. One bachelor gave her five cents for every article she washed for him. There was always music and dancing in the home. Margaret would really whistle the old-time tunes as she went about her household duties. Neighbors often came to sing and dance. The Huttons had the Murchison Post Office, R.R. No. I from January I, 1893 to August 31, 1926. Alexander "Sandy" Brown brought the mail from Franklin. After this Post Office closed the mail came by train to Bethany and Clanwilliam. The old log house where most of the family grew up was replaced by a modern home in 1918. A dynamo and 16 batteries supplied electricity and a pressure system was installed for the waterworks.